Important Note: Riva makes use of Categories as the indicator that an item needs to be synchronized to the CRM. When Riva syncs data from the CRM to each mailbox, the Riva service automatically assigns the appropriate category. General - Identify the name of the policy and the target CRM connection and target mailboxes. Scheduling - Settings to control full and quick drop folder sync frequencies. Attendee Syncing - Settings to control calendar processing and attendee filter options. SmartConvert - Settings to enable and configure how email items can be converted to CRM items. Inbox and Sent Item - Settings to enable and configure auto sync of email from the mailbox sent folder. AssignTo - Settings to enable and configure creating and using drop folders for modules enabled on the Other page. After the CRM sync policy has been completely configured, the policy can be saved and the Riva CRM Agent Service can be installed. Certain sync policy options will be locked down to prevent sync errors in the future. A Riva connection to the target email system has been created and tested. Contacts and leads are copied from the CRM to the user's Address Book and assigned a Riva sync category. If SmartConvert is enabled, a set of Create New email sync drop folders are created. If AssignTo is enabled, a set of AssignTo folders are created with corresponding unique email sync drop folders by module type. Drop Folder Sync: Scheduled check for and sync of email from drop folders to the CRM. Re-initialize Sync: If data sync has stopped or become unlinked or corrupted, the administration can re-initialize all or selected target user accounts. For more information, see Manage syncing users and re-init options for sync policies. To limit testing and mitigate the impact against the target systems, select only one or two target users. Actively involve those users in the testing of Riva syncing of CRM and email data. After the CRM sync policy settings are finalized and tested, add the remaining target users. Confirm that the initial synchronization is successful and at least two complete data sync cycles are completed for every new target user added to the policy. In the left pane, under Enterprise CRM Integration, select Exchange CRM Synchronization or IBM Notes CRM Synchronization. The Edit CRM Synchronization Policy window appears and displays its General page. enable or disable the sync policy. Only the target mailboxes are identified. When Riva syncs to the CRM, Riva links to a CRM account with the primary email value that is identical to the primary SMTP email address value of the corresponding target mailboxes identified in this list. DO NOT CLICK SAVE. Proceed with setting the Sync Start Time settings. Enter the Synchronization Start Time, which creates a historic item filter and defines which items are copied from the CRM to the target user's mailbox during the initial sync. By default, Riva schedules each target user for a full sync every 5 minutes during peak times and every 30 minutes during off-peak times. Additionally, Riva is configured to perform drop folder checks at a faster frequency than full syncs and to dynamically schedule drop folder checks based on the number of target users and the full sync schedules. Adjust the peak and off-peak full sync frequency to best match the number of target users, which modules are enabled, the expected number of changes to data in the CRM or in the mailbox, and whether the CRM is on-premise or is hosted. By default, Riva has "peak" times configured as Monday to Friday, 7 am to 6 pm. (Riva uses the Riva server locally configured time zone.) Make adjustments to these values to accommodate users who work from different time zones. By default, Riva has "blackout" times configured as Sunday to Saturday, 11 p.m. to 5 a.m. (Riva uses the Riva server locally configured time zone.) Make adjustments to these values to accommodate users who work from different time zones and scheduled maintenance routines for on-premise mail servers and CRM servers. Clear or select the Check drop folders on fast sync schedule check box. [Cleared]: Disables drop folder checking and syncing on a fast schedule. Email drop folders are checked during the full sync cycle for each target user. For more information, see Adjusting CRM drop-folder quick check schedule. [Selected]: Drop folder checking and syncing are on a fast schedule. Clear the Automatically calculate drop folder sync schedule check box to manually specify a fixed schedule for drop folder syncing. enable/disable lead sync and define lead sync filters. By default, Riva is configured to handle "Private" contacts and to deal with the "Company" name field of Exchange contacts. Configure the Address book category / name and Color settings. When Riva performs an initial sync, if either contacts or leads are enabled, Riva adds the Address book category name to the user's Exchange master category list. By default, Riva displays a category name that matches the target CRM. If the CRM sync policy has not been saved for the first time, the value for the category name can be modified. Once the CRM sync policy is saved for the first time, the values of category names are locked and grayed out. By default, all contacts that Riva syncs from the CRM and creates in the Exchange address book are categorized and colour-coded with the defined colour. A different colour can be selected from the drop-down list. For leads, assign a subcategory name and colour under Leads; see Apply one or more filters. Look at the Require category and Sync all new from an Outlook perspective. By default, Riva is configured to Sync all new, which indicates that every time a user creates a new contact in the configured Exchange address book (new address book or the default address book), Riva automatically categorizes it and syncs it to the CRM during the next full sync cycle (unless the contact is marked as Private). Changing to Require category means that the user must manually assign the Riva sync category to the contact to force it to sync to the CRM during the next full sync cycle. Set the Exchange Address Book options. File As: Defines how the contact is saved and displayed in the Outlook address book and matches the Outlook "file as" options for contacts. The default is First Middle Last Suffix, which displays contacts like, for example, "Aldo Zanoni". Match account domain: Defines how Riva matches the account name when it syncs new contacts from the Exchange address book to the CRM. Create Separate Address Book: <categoryName>: (Default.) If this is selected, Riva creates a contacts folder under My Contacts and assigns the folder name identified in the Address Book category / name value. For Riva to sync new contacts to the CRM, those new contacts must be created in this contact folder and be assigned the Address Book category from the master category list. If Sync all new is selected, Riva automatically assigns that category and syncs the new contact to the CRM. Use existing default address book: If this is selected, Riva syncs contacts from the CRM to the default contacts folder under My Contacts. After Riva completes the initial sync cycle, then to cause a new contact that is created in the default address book to be synced to the CRM, users must manually assign the CRM category. Users can also assign the CRM category to pre-existing contacts in this folder if they want to sync them to the CRM. 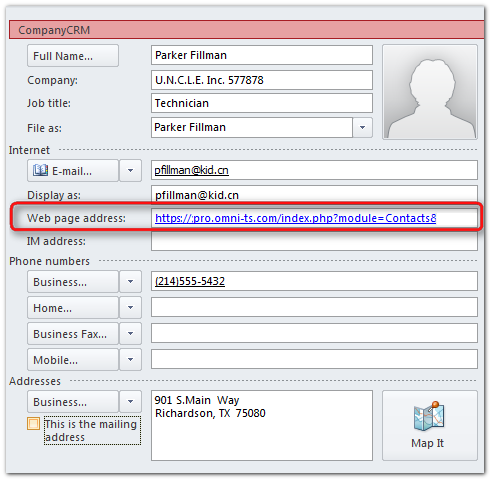 Replace Outlook contact website field with Contact web-link to view record in CRM: If selected, this option forces Riva to sync the value of the CRM contact record website link into the Web page address field of the corresponding Outlook contact record. This allows the user to select that link to immediately open the contact record in the CRM, thus providing access to all the items that are related to the CRM contact. For more information, see Add Edit / View links to email contacts. Synchronize Contacts: (Enabled by default.) Clear or select the check box. [Cleared]: Syncing for contacts is disabled. [Selected]: Riva adds a <categoryName> (for example, "CompanyCRM") to the user's Exchange master category list for contacts. Configure Duplicate Detection: Includes options to ignore duplicate checking, prevent duplicate creation, or relate email to CRM contact records when duplicates are discovered. For more information, see Contact duplication prevention - detection and handling guide. Configure Required Fields: Use this option to define fields in email contact records that must contain a value before Riva is allowed to sync a contact to the CRM. This is a valuable filter to prevent incomplete contacts from being created in the CRM. For more information, see Contact required fields - configuration guide. Advanced Flow Control: Use these options to modify the default handling of contact creates, updates, and deletes when originated in the CRM or email system. Synchronize Leads: (Enabled by default.) If the check box is cleared, syncing for leads is disabled. Lead Subcategory: Leads are placed in the same folder as contacts. All Leads synced from or to the CRM are assigned the <categoryName Lead> category (for example, "CompanyCRM Lead") from the user's Exchange master category list. Lead Colour: Riva supports assigning a different colour to leads that are synced. Bidirectional: (Default.) Syncs contacts and/or leads from the CRM to Exchange and from Exchange to the CRM. CRM to Exchange Only: Enforces one-way syncing from the CRM to Exchange. All visible: All CRM contacts and/or leads that are visible are syncable to the corresponding user's Exchange address book, but other filters also apply. Must be Owner: Only the contacts and/or leads that the user owns (or is assigned) in the CRM are synced to the corresponding user's Exchange address book. Certain CRM systems "Sync to Contact" or similar options. For more information, see Sync to Outlook contact filter options for Sugar. set an option to sync Exchange appointments that contains private Outlook contact attendees as privatized appointments to the CRM. By default, appointments, meetings, and/or events are synced from the target users' CRM calendar to their primary calendar in their Exchange mailbox (Outlook calendar). Riva supports appointments that are flagged as Private. See Private appointments. If a calendar item is configured to sync, then when Riva performs its initial sync, Riva adds the Calendar category name to the user's Exchange master category list, and Riva syncs the current CRM calendar items to the target user's Exchange calendar and assigns the Calendar category name. By default, Riva displays a category name that matches the target CRM. If the CRM sync policy has not been saved for the first time, the value for the category name can be modified. Once the CRM sync policy is saved for the first time, the values of category names are locked and greyed out. By default, all calendar entries that Riva syncs from the CRM and creates in the Exchange calendar are categorized and colour-coded with the colour selected here. A different colour can be selected from the drop-down list. For phone calls, assign a subcategory name and colour under Phone Calls; see Apply one or more filters. Look at the Require category and Sync all new from an Outlook perspective. By default, Riva is configured to Require category. This means the user manually assigns the Riva sync category to the calendar item to force it to sync to the CRM during the next sync cycle. This option can be applied only by email clients that support categories; most mobile clients do not support this option. Changing to Sync all new indicates that each time a user creates a new calendar item in the Exchange calendar (from any email client - including mobile clients), Riva automatically categorizes it and syncs it to the CRM during the next full sync cycle. To have historic calendar items processed that were created before starting Riva, the user can manually categorize them or work with our professional services team to handle historic calendar entries. Riva automatically syncs alarms in the CRM to Exchange/Outlook as notifications (and vice versa). The Disable reminder synchronization option turns alarm / notification sync off. Even with this option selected, the first time sync of calendar items from the CRM to Exchange sets a 15-minute notification. For instructions on completely disabling all alarm and notification syncing, see Disable alarm and reminder synchronization. If Disable reminder synchronization is selected, you can set the Override Default Reminder option. Riva sets the default reminder to the calendar appointment that it creates in the target system. If a user creates a calendar item in the CRM, Riva syncs that appointment to Exchange or Notes, overrides the default reminder setting, and sets the reminder by using the time specified in the drop-down. The same occurs when the calendar item is created in Exchange or Notes and synced to the CRM. Configure the related contact details. Select the button for options to append contact details to the appointment subject or body, and resolve contact links between CRM and mailbox appointments.. Select a recurrence option (Exchange to CRM): Make Riva sync the first appointment of a recurring calendar series from Exchange to CRM, or make it sync the entire recurring series. For more information, see Synchronize Exchange recurring appointments. Sync Direction: By default, syncing for all Calendar item types is set to Bidirectional. Optionally set this to CRM to Mail Only, which makes Riva sync unidirectionally, from the CRM to the email system, essentially treating the CRM calendar items as read-only from the mail system. Phone Calls (or other calendar item types): Riva provides a default Subcategory name and colour. A best practice is to provide a different colour for each calendar item type so that they can be easily differentiated in Outlook calendars. By default, Riva syncs CRM calendar deletions as deleted items in Exchange. To ensure that deleted CRM appointments sync to Exchange as Cancelled appointments, select this option. For detailed instructions, see Calendar option to handle deleted CRM calendar items. Set the email system advanced options. (Riva 2.4.50 or higher.) Skip Exchange appointment if set to "Show As: Free"
(Riva 2.4.50 or higher.) Skip IBM Notes appointment if set to "Show As: Available"
By default, Riva ignores all appointments that have the setting "Show As: Free" or "Show as: Available" (not only all day events that have those settings). By default, when someone schedules an appointment in Outlook or IBM Notes, it is marked respectively "Show As: Free" or "Show As: Available". In email clients, other users still see the user as free or available when doing a busy search. Select or clear the check box. [Selected]: Riva does not sync appointments that are marked as free or available to the CRM. The screen shot shows the wording used in Riva 2.4.49 or earlier. Skip email appointment if "Private". By default, Riva syncs Exchange appointments marked as private to the CRM and either handles them as private CRM appointments (if the CRM supports the private flag) or "privatizes" the appointment in the CRM (see Private appointment handling). Select this option to skip Exchange private appointments. This option can also be applied with an app.settings file; see Custom option to ignore private appointments. For email system originating appointments, do not update appointment body from CRM. By default, Riva syncs any changes made to calendar appointments in the CRM. For appointments originating in the email system, Riva syncs the appointment body to the CRM, removes HTML formatting, and may drop contents past a certain number of characters. Selecting this option prevents Riva from syncing the body content of those appointments back to Exchange, which would inadvertently apply unwanted content changes to the Exchange appointment. (Office 365 and Exchange only.) If Exchange appointment contains any private Outlook contact attendees, sync as privatized appointment to CRM. If this check box is selected and an Outlook appointment attendee list contains an Outlook contact that is flagged as private, the appointment is treated as a privatized appointment. Depending on other sync rules, it may or may not be visible in the CRM. configure calendar attendee sync options and filters. Note: By default, this feature is configured to inherit and use the email processing options from the SmartConvert page, even if the SmartConvert feature has been disabled. delete private tasks from the CRM. By default, Riva syncs CRM tasks (personal or module-specific) to the user's Exchange task list and syncs new Exchange tasks to the user's task list in the CRM. This screen shot displays the default settings for task synchronization. When Riva performs an initial sync, if any task item type is enabled, Riva adds the Task category name to the user's Exchange master category list, and Riva syncs the current CRM tasks to the target user's Exchange task list and assigns each the Task category name. By default, Riva displays a category name that matches the target CRM. If the CRM sync policy has not been saved for the first time, the value for the category name can be modified. Once the CRM sync policy is saved for the first time, the values of category names are locked and greyed out. By default, all contacts that Riva syncs from the CRM and creates in the Exchange task list will be categorized and colour-coded with the defined colour. A different colour can be selected from the drop-down list. Select Require category or Sync all new. Not all CRMs support a privacy flag for tasks. Riva does not check or set privacy flags for tasks synced from Exchange to the CRM. Require Category is the recommended default option to permit more granular control for users, so that they can decide which tasks to sync. Require category: (Default.) The user must manually assign the Riva sync category to the task item to force it to sync to the CRM during the next full sync cycle. This option is supported only by Exchange clients that support categories; this is not supported by most mobile clients. Sync all new: Each time a user creates a new task item in the Exchange task list, Riva automatically categorizes it and syncs it to the CRM during the next sync cycle. The Sync all new option applies to all Exchange clients, including mobile clients. Sync Direction: By default, syncing for Task items types is set to Bidirectional. Syncing can be set to CRM to Exchange Only, which makes Riva sync unidirectionally, from the CRM to Exchange, effectively treating the CRM task items as read-only. Delete Private Tasks. This feature is used to remove previously synced Exchange tasks from the CRM that should have been personal or private tasks. If the check box is selected, selecting a task in an email client and marking it as "private" ensures that Riva removes that task item from the CRM in the next deletion cycle. DO NOT CLICK SAVE. Proceed with configuring the Other options. Configure the Parent folder name for module. If either SmartConvert or AssignTo are enabled, during the initial sync, Riva creates a parent folder name to contain the email sync drop folder structure. By default, Riva displays a parent folder name that matches the target CRM. If the CRM sync policy has not been saved for the first time, the value for the parent folder name can be modified. Once the CRM sync policy is saved for the first time, the values of parent folder names are locked and greyed out. Filters affect the email drop folders and connect email items that Riva will sync to the CRM. If the Opportunities module is enabled, Riva creates drop folders for the most current opportunities based on these filters and the filter settings in the AssignTo page. Filter by: All Visible. Riva creates drop folders and connects to email items for the most current opportunities that are visible in the CRM. This may be a good option for supervisors, team leaders, and managers who need to see opportunities, cases, quotes, etc. that they do not own. Filter by: Must be Owner. Riva creates drop folders and connects to email items for the most current opportunities that are assigned to the target user in the CRM. This may be more appropriate for account executives and sales reps with defined opportunities who need to see only the opportunities they own. SmartConvert is Riva's method to sync a copy of an email from Exchange to the CRM. Note: Even when the SmartConvert feature is disabled, its options remain editable, in case the Attendee syncing feature is set to inherit its settings from SmartConvert. Define the parent folder name for the conversion drop folders. Parent folder name for convert folders: This identifies the prefix for all of the email sync drop folders. If modules are not enabled on the Other page, this adds a "- Create New Email" drop folder immediately below the CRM sync parent folder. If modules are enabled on the Other page, this adds "- Create New <type>" folders throughout the CRM sync folder structure. Using SmartConvert to Create Cases, Opportunities, Quotes, or Projects. When a user places an email in a "- Create New <type>" drop folder, Riva creates the new item in the CRM by using the following process. For the purposes of this example, we will discuss creating a new opportunity. The process is the same for all object types that are enabled on the Other page. Riva attempts to match the recipient email address to CRM users, contacts, leads, and/or accounts. If Riva does not find a match in the CRM, it creates a CRM account and contacts as required. New CRM contacts and accounts are assigned to the CRM user who converts the email by using SmartConvert. If multiple CRM matches are discovered, Riva relates the item to all matches by default. If the AssignTo feature is enabled, Riva creates an Opportunity connect email in the Opportunities folder in the target user's Exchange account. Riva also creates an Opportunity drop folder under the Opportunities - AssignTo folder. For more information, see the AssignTo page. Riva manages the processed email item and either deletes it from the "- Create New Opportunities" drop folder or returns it to the Inbox, depending on the configured option. When a user places an email into a "- Create New" drop folder, Riva reads the addressees in the header of the email and attempts to find a matching CRM user (referred to as the "system user" in the Riva logs), contact, and/or lead in the CRM for each addressee. Syncing (creating a copy of) the email into the CRM is handled in accordance with the contact and account/organization (and email item handling) option settings. Treat replyTo as email sender: (Default: enabled.) When selected, this option ensures that Riva matches an email's replyTo value as the email sender. This feature supports syncing emails from web services that show the customer's email address as the replyTo value because the sender is always the email address of the web service that generates the email. Disable Creates for CC/BC: (Default: not enabled.) If this option is selected, Riva does not match CC or BC recipient against CRM users, contacts, or leads. If no Contact is matched, match against Leads: (Default: disabled.) If this option is enabled, Riva attempts to match email addressees against CRM leads if there is no corresponding CRM contact. If recipient is not matched, create Lead instead of Contact: (Default: disabled.) If enabled, Riva will create a new CRM lead for an email addressee if Riva cannot match against a corresponding CRM contact or lead. Delete item upon successful processing, instead of returning to folder: (Default: cleared.) Select or clear the check box. [Cleared]: If Riva can sync the email item to the CRM, it moves the email item back to the Inbox and adds the category Processing Complete to the email. This is a visual cue to the user that the email sync was successful. If Riva cannot sync an email because an error has occurred, Riva leaves the email item in the "- Create New" drop folder and adds an ERROR category to the email item to help identify the cause of the non-sync issue. This option is recommended if users are going to manage emails from mobile devices. [Selected]: If Riva can sync an email item to the CRM, Riva deletes and purges the email item from Exchange. Advise all users to place a copy of email items in "- Create New" drop folders. Placing an original email item in a drop folder results in its being deleted and purged, which makes the email item non recoverable. Caution: This option is not recommended for users who manage emails from mobile devices, unless the mobile device has a "copy" option. Most mobile devices allow users only to move an email to another folder. This is a major change to how Riva handles email items in "- Create New" drop folders. Prior to the 2.4.24 release, Riva would delete and purge email items from drop folders unless this option was enabled as an advanced custom option. If Riva is configured with that advanced option, it automatically adopts that same setting when Riva is upgraded to release 2.4.24+. If the advanced option was not configured, Riva sets this option as enabled (selected) when Riva is upgraded to release 2.4.24+. and delete item if no recipients matched or created, instead of remaining in folder: If the Delete item upon successful processing and Users and contacts are mutually exclusive options are both selected, this related suboption automatically removes emails for which Riva cannot find a required match. This option is normally selected when implementing Outlook rules to autoarchive inbound email. Include Original Mime as Attachment: (Default: not selected.) (Available for Exchange, but not for IBM Notes.) When this option is selected, Riva saves the email in the activity history and saves the original email as a MIME attachment (.EML file). For more information, see Sync original MIME email as .EML attachment in the CRM. Include original attachment with the Mime attachment: (Default: not selected.) (Available for Exchange, but not for IBM Notes.) When this option is selected, Riva saves email attachments related to the Mime attachment (instead of being saved in the activity history). configure email sync options and filters. Warning: This feature is disabled by default. Enabling this feature on the Inbox page and/or the Sent Items page in conjunction with clearing (= not selecting) the Require Category check box results in the automatic archiving in the CRM of respectively all email in the Inbox folder (not including child folders) and/or all email in the Sent Items folder (not including child folders). Automatic email archiving can contribute to a significant increase in the amount of data stored in the CRM. Because Riva cannot distinguish between single emails and threaded email discussions, a copy of every email in the thread is synced to the target CRM. Enabling automatic archiving of all email can result in significant additional associated data storage costs for the CRM solution. We recommend fully investigating data storage costs with the CRM vendor before enabling autosync of all email. Require Category option: If you select the Require Category check box, the automatic email processing is disabled, and users can manually categorize any pre-existing email in the Inbox and/or Sent Items folders to trigger Riva to sync that email to the CRM. The category name is defined on the Other page as the parent folder name. To enable email sync directly from the user's Inbox and/or Sent Items folders (but not their subfolders), select the Enable Processing check box on respectively the Inbox and/or Sent Items pages. There are no email drop folders for Inbox or Sent Items processing. The Inbox and/or Sent Items processing archives in the CRM every email that is saved to respectively the Inbox and/or Sent Items folders (except their subfolders) in the target user's Exchange mailbox. Note: Riva 2.4.33+ has a Require Category processing option, which if selected (on the Inbox and/or Sent Items pages) archives only the emails from respectively the user's Inbox and/or Sent Items mailbox folder if the user has assigned the Riva category to the item. This is usually a category that is named after the SmartConvert parent drop folder/category name specified on the Other page. AssignTo is Riva's technology: Dropping email items into designated folders archives the items to the CRM modules that are enabled on the Other page. configure AssignTo email drop folder sort options. Category name: This is the Exchange category that is assigned to an email item that is placed in an AssignTo drop folder. When Riva performs a sync, the category name instructs Riva to sync a copy of the email to the applicable item (case, opportunity, etc.) in the CRM. There is no need to change the category name. Under AssignTo Folder Creation Filters, select and configure filters. [Selected]: Riva creates a maximum number of drop folders per module; for example, a maximum of 30 individual case drop folders and 30 opportunity drop folders. If the maximum number of folders exist and a new object (opportunity or case) is created or modified in the CRM, Riva removes the oldest drop folder to make room for the newest drop folder. During the initial sync, Riva creates individual drop folders for the most current items based on the last created or modified date for the item. Tip: If a drop folder does not exist for an open or active item, the user can force Riva to add a drop folder by opening that item in the CRM and saving it. The item does not need to be modified; all the user has to do is save it. The save modifies the date last modified, and Riva sees the item as the most current item and syncs an individual drop folder for the item. [Cleared]: Riva creates a unique drop folder for every active item in the CRM that is assigned to the user (based on the security filter applied for that module on the Other page). [Selected]: Riva automatically removes an item drop folder if it becomes stale based on the number of days that the item has not been updated in the CRM. Activity against an item includes changes made to the item in the CRM and any emails that are synced to the item through the corresponding AssignTo item drop folder. Tip: Set the value to the average length for sales cycles or case resolutions cycles. [Cleared]: Tip: We actually recommend selecting the filter to reduce the total number of item folders that Riva has to check every sync cycle and quick folder check. Sort by date modified: (Default.) Once drop folders are created under the AssignTo folders, the folders are displayed in a descending order by date/time last modified with the most current folder at the top of the list. Sort alphabetically: Users who have many AssignTo drop folders may find them more easily in alphabetical order. Riva also provides an advanced option to modify the order of AssignTo drop folders. specify the CRM connection method. Every target user consumes one execution thread per sync cycle. If the Maximum number is set to 3, Riva can sync three users concurrently. Set this value to best match your environment. This option is used to throttle the processor load on the Exchange and CRM systems. For normal sync cycles: 2 or 3 threads for GoldMine, Saleslogix, hosted On Demand CRM services, or Exchange MAPI connections. Use Impersonation: (Primary method.) (Default.) This is the most secure, scalable, and preferred option. It uses the credentials of the Riva connection accounts to the CRM and to Exchange to impersonate each account. Passwords are not required, because the connection "impersonates" the user of the Exchange and CRM service accounts. The CRM account used in the CRM Connection Wizard must be an administrator-level account, and the CRM must support impersonation. Not all CRM solutions are supported. Some CRM systems need special configuration. If this option was not already selected and you want to use impersonation for the CRM connection, select this option. Riva opens a window to confirm that the impersonation will work when using the CRM connection selected on the General page. to synchronize a single CRM account to many Exchange accounts. Use LSAKey to extract LDAP password: (Secondary method.) If LDAP authentication is configured on the target, this method uses the LSAKey to extract the LDAP password for each Active Directory account and connect to the CRM with the extracted credentials. This method requires configuring a Riva Active Directory Connection in addition to the Exchange connection. For more information, contact the Riva Success Team. To implement LSAKey support, contact the Riva Success Team. Use a CSV file that contains CRM login information: This method uses a CSV file that contains the email address, CRM user name, and password. This is the least secure option. It is used when email addresses for target accounts in the CRM do not match the corresponding target account in Exchange and email addresses cannot be modified; or when no other option works with the target CRM. Under Privilege Exception Handling Options, set how to handle create, modify, and delete CRM permission/privilege errors that prevent an item from being synced from the Exchange account to the CRM. Under Contact Deletion Options, select or clear the check boxes to govern the syncing of contact deletions from the Exchange account. For more information, select the links. Move deleted contacts to "Deleted Items": (Default: [Selected].) When a user deletes a Riva-synced contact in the CRM, Riva deletes the contact in Exchange and moves it to the Deleted Items container in the user's mailbox. [Cleared]: Attachment syncing is enabled. Append attachment summary (name and size) to body: (Default: [Cleared].) This option works only with Sugar, intelecrm, SuiteCRM, GoldMine, NetSuite, Oracle On Demand, and Salesforce. [Selected]: If an item with attachments is synced to the CRM, an attachment summary indicating the name and size of the attachment is added to the body of the item saved in the CRM. Attachment Filtering - Filter by Maximum File Size (MB): (Default: [0, which means "Unlimited".) Specify the maximum size value for attachments. This value is applied against any attachment that Riva attempts to sync to the CRM. Attachment Filtering - File Extensions: (Default: [Filters are empty].) Select the Include or Skip option; select Configure File Extensions; and in the text box that appears, specify a comma-separated list of file extensions for this filter. Inclusive filter: Select Include attachments with specified extensions to make this filter inclusive. Only the attachments that match the file extensions listed in the text box and equal to or less than the specified maximum file size are synced from Exchange to the CRM. This is for users who use email clients, applications, or mobile devices that do not support Exchange "Private" contacts. This option would be used if contacts are being synced to the Default Contact List and a mobile user wants to create a contact and flag the contact as "Private". By adding one of the key words to the "Company" field when creating a new contact, a user prevents Riva from syncing the contact to the CRM. By default, if Riva encounters the email address of a distribution group, it does not expand that list to determine the addressees. If the Enable Distribution Group Look-ups check box is selected, Riva queries the Exchange system to expand the distribution group if the email address of the group matches the current user. If the Exchange system supports additional email domains for distribution groups, use the list to add those domain names. Warning: Enabling this option requires additional system resources and affects the performance of the Riva server and of the connected Exchange system. Select CRM Universal Change Detection (UCD). UCD is used to modify how Riva queries the CRM for updates for all users at the same time and triggers immediate user sync polls for those users that have created, deleted, or updated an item in the CRM. Use this feature to prioritize user sync polls based on user updates to CRM data. Do not configure this option until you contact the Riva Success Team to discuss how to configure it. A new CRM sync policy can be saved at any time. The very first time the very first CRM sync policy is saved, Riva opens a window to ask if it can install the CRM Agent Service. If the CRM sync policy is enabled and Yes is selected, the service is installed and started. If there are no enabled policies (the best practice is to disable new policies when you create them), no data will be synched between the CRM and the email system. The policy object appears in the Policies tab of the Riva Manager application. Tip: To open a policy, double-click the policy object. The Sync Start Time tab changes to lock the Sync Start Date and Time. For Riva 2.4.39 and earlier, the list of target users appears, and re-initialization options become available below the target users list. For Riva 2.4.40 and higher, a Load Users link appears, and re-initialization options are available by clicking the pencil icon in the tool bar. Sync Start Time page: Riva 2.4.40 or higher. On all other policy pages, the category and sub-category names, address book names, and parent folders are greyed out. It is not possible to make changes to those items unless all of the users are selected and a Full re-initialization for all users for all modules is selected on the Start Sync Time page. See How to re-initialize users. Sync Start Time: Full Delete All - Riva 2.4.40 or higher. This action unlocks all the locked fields and settings in the CRM sync policy. If the policy has never been synced before through the Riva CRM Agent Service, there is no effect on the first initial sync of the users when the policy is enabled. Riva On-Premise for IBM Notes. Advanced options: Riva 2.4.24 or higher. Attachment (inclusive/exclusive options): Riva 2.4.25 or higher. Advanced scheduling: Riva 2.4.26 or higher. Inbox and Sent Items: Riva 2.4.35 or higher. Major changes to navigation: Riva 2.4.36 or higher. Change to the Sync Start Time page layout: Riva 2.4.40 or higher. Match New Contacts Based on "Company Name" and "Email Address"